Ever dreamt of knitting your own traditional Icelandic wool sweater – your own Icelandic lopapeysa? 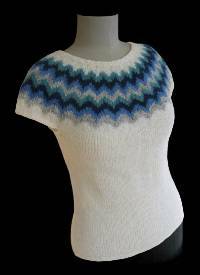 Now you can get a free pattern of a basic Icelandic wool sweater with a beautiful pattern, the same as Actress Scarlett Johansson is wearing in the movie “We bought a Zoo” from 2011. Instructions available in English, Finnish, and Icelandic. Download this free pattern of the beautiful sweater Aftur, designed by Védís Jónsdóttir by clicking here. Let’s Knit is UK’s bestselling knitting magazine and specializes in knitting patterns, crochet, yarn and much more! We are honored to share with you their blog and their recent review about Álafoss. Body is worked in the round from lower edge to underarms, then worked back and forth, finally yoke is worked in the round. Pattern and dec are worked from chart. Round begins and ends at left side of body but on yoke round begins and ends on left side of back. Just wanted to share with you another free knitting pattern from Istex. It’s a beautiful wool vest knitted from 100% pure Icelandic wool, Léttlopi. The vest is designed by Védís Jónsdóttir and has been named a Spring Morning Vest.